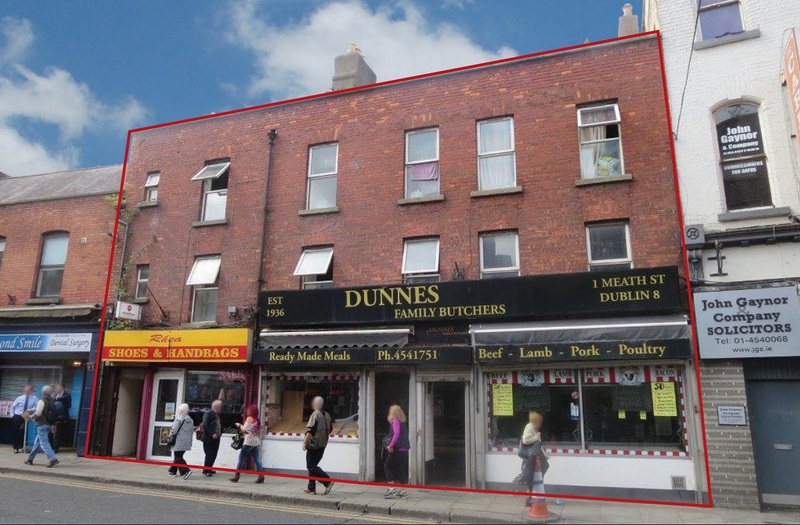 The property is located on the west side of Meath Street close to its junction with Thomas Street. Meath Street, which is one way, connects The Coombe with Thomas Street in the Liberties area of the city. Thomas Street has seen the arrival of a number of national and international retailers such as Tesco, Dealz and Lidl which, together with access to the general Guinness Storehouse, has increased footfall on Thomas Street. The property comprises a three-storey building with a small single-storey section to the rear. The property is of traditional construction with a red brick façade and a pitched and slated roof. The property is currently laid out as a butchers shop with a store located to the rear of Unit 1A, and access to first floor accommodation for staff welfare areas. The remainder of the ground floor has been subdivided to create an individual retail unit. The ground floor could be amalgamated into one unit. Separate access is provided to the upper floors which comprise a 1-bed apartment at first floor, and a 2-bed apartment on the second floor. All intending purchasers are specifically advised to verify the floor areas and to undertake their own due diligence.